I’ve enjoyed observing the night sky since a rather early age. There’s nothing like looking up into the vastness of space and realizing how small you really are. I’ve heard many express that in comparison of planet Earth it's as being a grain of sand on the beach. Which in the literal, physical, universal sense is true. Within the confines of the cosmos I'm not sure if our planet isn't comparatively even smaller than a grain of sand. And yet, the building blocks of all the material in this universe, the whole expanse is founded on something smaller than a grain of sand. Atoms. Something so small created from things so large... from the interior of stars. Created by the extreme gravity and mind boggling heat spewn outward into space by solar storms providing the foundation of all creation. Which is kind'a like how our brightest scientific minds explain how the universe began. It was from an early age I became fascinated with the heavens. I grew up on a lakeside resort in the center of the lower peninsula of Michigan that was known as Sunset Haven. (My folks sold it about 10 years ago and is now known as Sunset Shores.) Many of my summer nights as a youth were spent on the beach with those that were renting my folks' cottages, our legs stretched out towards a pit-fire. A pit that I personally maintained. As my maner was, I was normally always the last one to turn in for the night. Yes, I had my daytime chores and they got done. Well, as I recall they did. Might have to confirm that one with my parents! But I remember this! I loved the last 30 minutes or so before turning in myself. This was my time. Alone with the universe. A boy with his thoughts. I loved fixing my eyes on the night sky observing the constellations with the enveloped darkness and the lake side sounds of the night such as bass jumping, crickets singing, frog's croaking in the background... wondering if there was something else out there, curious how it all began, wondering what it all means. A neighbor of mine gave me a telescope a few summers ago. Nothing fancy really, but a telescope all the same. Said he had it for 5 years and couldn’t figure it out. We won’t tell you his reaction when he found out I had it working in less than an hour! I set it up on my deck the first night and pointed it towards the southern, darkened heavens at the brightest star out there. Can you imagine my reaction when I noticed there where 4 little “stars” around that star with my new “magnificationally advanced” eyesight! After a slight pause to think (really! It really didn’t take me too long!) I figured that I was gazing at Jupiter. Jupiter! A planet! Yeah, yeah I know! It’s been up there since…, well, forever! But I haven’t seen it like this before and was kind'a new at this. And it is pretty cool to see what Leonardo DaVinci first saw so long ago... The four moons of Jupiter. Just four. 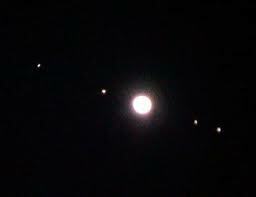 Io, Europa, Ganymede and Callisto referred to as the Galilean satellites today. Apparently there are 63 moons orbiting Jupiter. Leonardo and have one thing in common... we could only see 4. 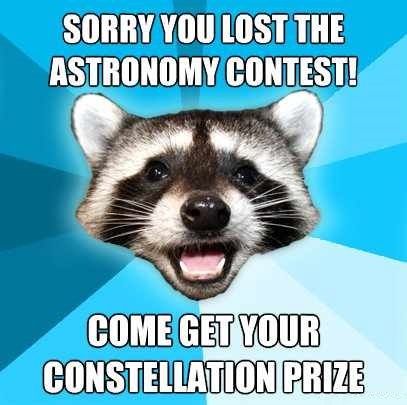 Guess his telescope wasn’t that fancy either! 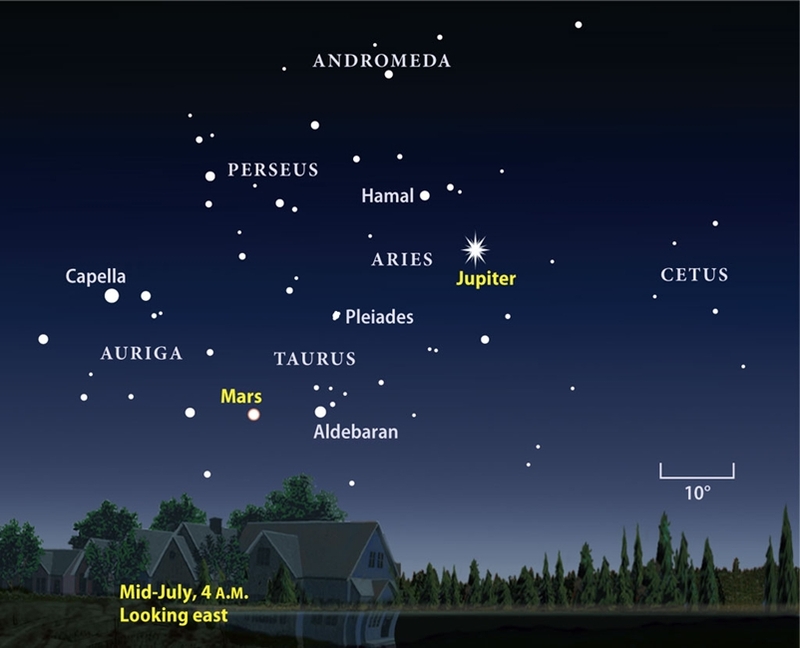 All it takes to see Jupiter and its four major moons today is a good pair of binoculars. It has normally been visible in the summer months the last 4 years located about 50 to maybe 60 degrees in the southern sky. 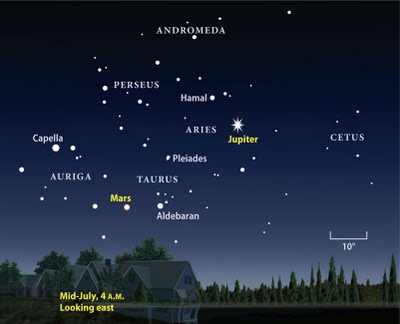 (Use this sky chart to track Jupiter for the next 3 years.) The planet "moves" westward as the night goes on. You've probably seen it. Many times. You haven't been able to miss it as it is the brightest object as you scan the heavens. At night I should say. Venus is the brightest, being closer to earth... even when it's a crescent... but normally visible for a few hours before dawn. It's so bright you can still see it on a clear morning after dawn for a spell! The last "star" visible before the sunshine takes over for the day. I've had to put this in the past tense as I haven't been able to use my telescope the last coupl'a summers as I now live on the side of a mountain in the woods. Quite a bit cooler living in the woods during this summer heat we've been having but I'm not sure it's a good trade off for not being able to sit at my pit fires these days without being able to see the stars. However! I will remedy that just as soon as I can! Wouldn't it just be too cool to be able to travel amongst the star systems? To explore strange, new worlds. To seek out new life and and new civilazations. 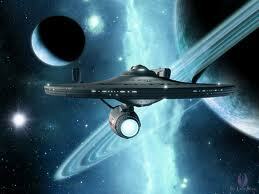 To boldly go... OK! You know the line! 'Sides, we don't want'cha ya thinkin' ya stumbled into a Star Trek convention! Alright! Back to planet earth! Seriously, don’t you just find it amazingly breath-taking how the darkness falls across the land as it has for uncounted generations to reveal a star spangled backdrop? And yet we are provided with this “lesser” light from all these uncovered stars at night so that we’re not totally blinded by the darkness after sunset. Ongoing since before this planet cooled off after forming. Modern science explains the beginning of the physical universe as "The Big Bang" and still mystifies the scientists studying the cosmos today. No mystery to those of us that believe God's Word when it tells us... With God all things are possible. Just a Big Bang? Maybe. Guess I can even say... Sure. 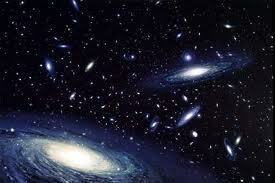 God operates within the laws he set up and science can monitor and track how the universe is expanding. And the snow on your TV when it's on an off-air frequency (channel) you don't receive a broadcasted signal on is the residual noise that is still reverberating today from that explosion. The explosion a matter of chance? I am confident there is a lot more to it than that! Sky And Telescope Nasa's Cosmicopia The Sky Is Falling!